Russia's Channel One Television news broadcast a picture and details of a nuclear-powered torpedo called Status-6 on about 12 November 2015. The torpedo was stated as having a range of up to 10,000 km, a cruising speed of 100 knots, and operational depth of up to 1000 metres below the surface. The torpedo carried a 100-megaton nuclear warhead. One of the suggestions emerging in the summer of 1958 from the first meeting of the scientific advisory group that became JASON was for "a nuclear-powered torpedo that could roam the seas almost indefinitely". Burevestnik nuclear-powered cruise missile announced by Vladimir Putin in 2018. Bimodal Nuclear Thermal Rockets conduct nuclear fission reactions similar to those safely employed at nuclear power plants including submarines. The energy is used to heat the liquid hydrogen propellant. Advocates of nuclear-powered spacecraft point out that at the time of launch, there is almost no radiation released from the nuclear reactors. The nuclear-powered rockets are not used to lift off the Earth. 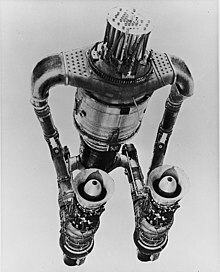 Nuclear thermal rockets can provide great performance advantages compared to chemical propulsion systems. Nuclear power sources could also be used to provide the spacecraft with electrical power for operations and scientific instrumentation. Anatolij Perminov, head of the Russian Federal Space Agency, announced[when?] that it is going to develop a nuclear-powered spacecraft for deep space travel. Preliminary design was done by 2013, and 9 more years are planned for development (in space assembly). The price is set at 17 billion rubles (600 million dollars). The nuclear propulsion would have mega-watt class, provided necessary funding, Roscosmos Head stated. According to him, the propulsion will be able to support human mission to Mars, with cosmonauts staying on the Red planet for 30 days. 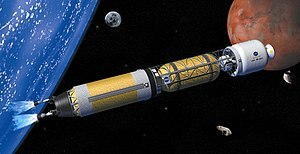 This journey to Mars with nuclear propulsion and a steady acceleration would take six weeks, instead of eight months by using chemical propulsion – assuming thrust of 300 times higher than that of chemical propulsion. The idea of making cars that used radioactive material, radium, for fuel dates back to at least 1903. Analysis of the concept in 1937 indicated that the driver of such a vehicle might need a 50-ton lead barrier to shield them from radiation. In 1941 Dr R M Langer, a Caltech physicist, espoused the idea of a car powered by uranium-235 in the January edition of Popular Mechanics. He was followed by William Bushnell Stout, designer of the Stout Scarab and former Society of Engineers president, on 7 August 1945 in the New York Times. The problem of shielding the reactor continued to render the idea impractical. In December 1945, a John Wilson of London, announced he had created an atomic car. This created considerable interest. The Minister of Fuel and Power along with a large press contingent turned out to view it. The car did not show and Wilson claimed that it had been sabotaged. A later court case found that he was a fraud and there was no nuclear-powered car. Despite the shielding problem, through the late 1940s and early 1950s debate continued around the possibility of nuclear-powered cars. The development of nuclear-powered submarines and ships, and experiments to develop a nuclear-powered aircraft at that time kept the idea alive. Russian papers in the mid-1950s reported the development of a nuclear-powered car by Professor V P Romadin, but again shielding proved to be a problem. It was claimed that its laboratories had overcome the shielding problem with a new alloy that absorbed the rays. In 1958 at the height of the 1950s American automobile culture there were at least four theoretical nuclear-powered concept cars proposed, the American Ford Nucleon and Studebaker Packard Astral, as well as the French Simca Fulgur designed by Robert Opron and the Arbel Symétric. Apart from these concept models, none were built and no automotive nuclear power plants ever made. Chrysler engineer C R Lewis had discounted the idea in 1957 because of estimates that an 80,000 lb (36,000 kg) engine would be required by a 3,000 lb (1,400 kg) car. His view was that an efficient means of storing energy was required for nuclear power to be practical. Despite this, Chrysler's stylists in 1958 drew up some possible designs. In 1959 it was reported that Goodyear Tire and Rubber Company had developed a new rubber compound that was light and absorbed radiation, obviating the need for heavy shielding. A reporter at the time considered it might make nuclear-powered cars and aircraft a possibility. Ford made another potentially nuclear-powered model in 1962 for the Seattle World's Fair, the Ford Seattle-ite XXI. This also never went beyond the initial concept. In 2009, for the hundredth anniversary of General Motors' acquisition of Cadillac, Loren Kulesus created concept art depicting a car powered by thorium. The Chrysler TV-8 was an experimental concept tank designed by Chrysler in the 1950s. The tank was intended to be a nuclear-powered medium tank capable of land and amphibious warfare. The design was never mass-produced. The Mars rover Curiosity is powered by a radioisotope thermoelectric generator (RTG), like the successful Viking 1 and Viking 2 Mars landers in 1976. ^ Gady, Franz-Stefan (2 March 2018). "Russia Reveals 'Unstoppable' Nuclear-Powered Cruise Missile". The Diplomat. Retrieved 26 March 2018. ^ Contact: Gynelle C. Steele (July 15, 2005). "F-22 Raptor Stealth". NASA Glenn's Research & Technology. Retrieved 2009-07-08. ^ Page, Lewis (5 April 2011). "Russia, NASA to hold talks on nuclear-powered spacecraft. Muscovites have the balls but not the money". The Register. Retrieved 26 December 2013. ^ (in Russian) Academician Anatoly Koroteev: "Nuclear power can provide a qualitative leap in the development of space"
^ "Benson Ford poses challenge on atomic powered automobiles". The Brooklyn Daily Eagle. October 2, 1951. p. 3. Retrieved June 4, 2015 – via Newspapers.com. ^ "Radioactive cars of the twentieth century". Retrieved 26 April 2012. ^ "Une anticipation Simca : la "fulgur"" (in French). Retrieved 26 April 2012. ^ Hearst Magazines (April 1957). "The Atom powered carPopular Mechanics". Popular Mechanics. Hearst Magazines. p. 141. ^ Hanlon, Mike. "Ford Seattle-ite: one of history's most significant concept cars". Gizmag.com. Retrieved 26 April 2012. ^ "1962 Ford Seattle-ite XXI". Retrieved 26 April 2012. ^ WTF? Cadillac World Thorium Fuel Concept? ^ Hunnicutt 1990, p. 36. ^ "Multi-Mission Radioisotope Thermoelectric Generator" (PDF). NASA/JPL. January 1, 2008. Archived from the original (PDF) on August 13, 2012. Retrieved August 6, 2012. ^ "Mars Exploration: Radioisotope Power and Heating for Mars Surface Exploration" (PDF). NASA/JPL. April 18, 2006. Retrieved September 7, 2009. Cushin, Harry (April 1951). "Atomic Power — In your car". Motor Trend.